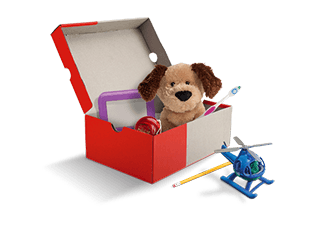 We’re excited you’re interested in packing shoebox gifts at your Christian school! Operation Christmas Child is a practical way for your students to spread Good News around the world right from their own homes. God can use their gift-filled shoeboxes to reach families, plant churches, and transform communities. Includes step-by-step instructions, shoebox labels, a spiritual impact story, and a donation envelope. Order enough for your congregation, group, or family. Materiales y publicaciones en español. Includes step-by-step instructions, shoebox labels, a spiritual impact story, and a donation envelope. Order enough for every student at your school. How to Pack a Shoebox Brochure Holder A great way to display brochures so they are easily available for your congregation or group. Promotional or Bulletin Insert This great tool contains a letter from Franklin Graham with a spiritual impact story as well as shoebox gift suggestions. 5.5" x 7.5" Materiales y publicaciones en español. Don’t have time for mail delivery? Print your own 8.5" x 11" editable version with gift suggestions and instructions for how to pack a shoebox. Promote local Operation Christmas Child events by customizing and displaying these posters in classrooms, meeting rooms, businesses, drop-off locations, or around your neighborhood. Materiales y publicaciones en español. Promote local Operation Christmas Child events by customizing and displaying these posters in hallways, classrooms, or around your community. Inspire your church or group by showing them how God is using Operation Christmas Child around the world. You also can view the contents of the DVD and download these videos online. Inspire your students by showing them how God is using Operation Christmas Child around the world. Remind your church or group to pray daily for everyone involved in the project, from the children who will receive shoebox gifts to those who pack them. Materiales y publicaciones en español. Remind your students to pray daily for everyone involved in the project, from the children who will receive shoebox gifts to those who pack them. Materiales y publicaciones en español. Order this set of sample resources, including a How to Pack a Shoebox Brochure, promotional insert, prayer guide bookmark, poster, and DVD of project videos. Materiales y publicaciones en español. Order this set of sample resources, including a How to Pack a Shoebox Brochure, promotional insert, poster, prayer guide bookmark, and DVD of project videos. Journey of a Shoebox Fold-out This 28" x 8" piece visually explains the journey of a shoebox from packing, collecting, and processing to delivery and The Greatest Journey. It shows at a quick glance what happens to a shoebox after it is packed.